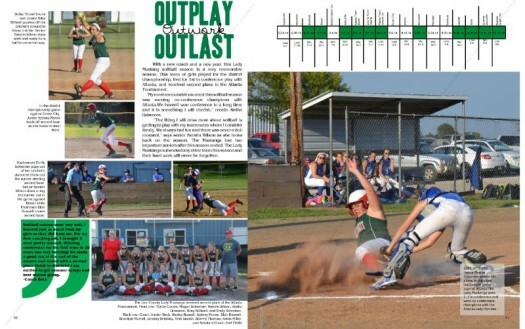 Nowhere in yearbook design can a series of small or minor changes add up to create a dramatic difference as easily as yearbook fonts. Really, it’s true. Science says so: A Microsoft researcher and MIT professor found in two different studies that good typography can make a person feel better while reading and can actually make them think they’re reading for shorter amounts of time. Pay attention to your yearbook fonts. Your readers will be happier, and they’ll spend more time with their yearbooks. In this all-purpose guide, we’ll introduce you to the basics of fonts and typography, how to create a font strategy for your yearbook (which includes picking yearbook fonts, pairing them, and setting their size), and how to make the yearbook fonts you choose look great on your pages. Let’s get started. We already told you about one cool scientific study related to fonts, but here’s another: Different fonts can actually speed up—or slow down—how quickly you can read. The kicker (though it’s not mentioned in that study) is that it all depends on where you’re reading. 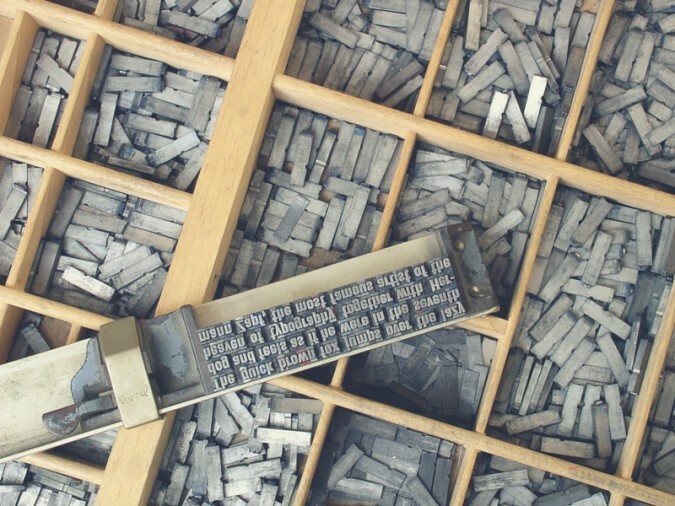 On printed paper—like yearbooks—the fastest, easiest-to-read fonts are usually serifs. On computer screens, like on this blog, the fastest, easiest-to-read fonts are usually sans serifs. And that reminds us… we should probably break down the difference between serifs and sans serifs. Serif fonts have small, decorative elements at the end of the strokes on the letters. They’re more legible at smaller point sizes and are generally considered more conservative (think newspapers and academic journals). Like we mentioned above, they’re also easier to read on a printed page. Sans serif fonts are different from serif fonts in that they don’t have the decorative elements at the end of the strokes. Sans serifs are more commonly used online and in digital projects, since they’re easier to read on computer screens. Because so many people read on computer—and phone—screens, though, sans serifs are more familiar to readers and growing more popular in print. They’re also considered to be a little hipper than a serif. Notice those “feet” on the one above? That’s what defines a serif. There are, of course, some other fonts, like scripts and decorative fonts. While they can be plenty attractive, they’re often not great for legibility—especially in large blocks of text. If you’re planning to use something a little different, it’s best to reserve those scripts and decorative fonts for special accents. We already mentioned that fonts can change a reader’s mood, make text easier to comprehend, and speed up the process of actually reading while making it more enjoyable. With some fonts being better at some things than others, though, you need to take stock of what you want your fonts to do before you start picking them. In other words, you need to set a strategy. How do you want people to feel when they’re reading your yearbook? Do you want your yearbook to look buttoned-up or hip? Should the fonts you use be familiar to your readers? 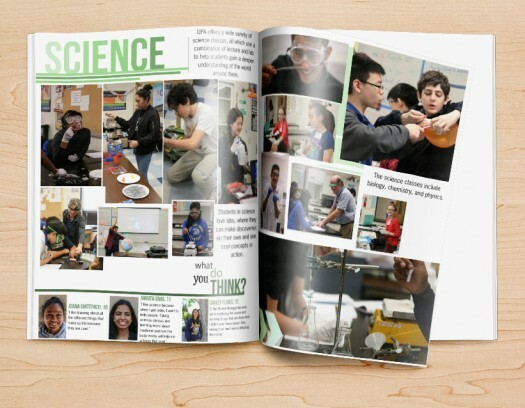 If you were to describe the look and feel of your designed yearbook pages, what words would you use? The answers will give you a strategy for your yearbook fonts, something that will help you cut down your potential choices to something more manageable. Don’t underestimate that importance: there are roughly 1,000 widely used fonts in existence. Your total number of yearbook fonts should pretty much always be two, and shouldn’t really exceed three. Why two (and no more than three)? Well, consistency is key for a balanced yearbook. Fonts are no exception. It’s better to use a couple of well-chosen fonts than to have so many that they distract from your design. Looking at this example, we can probably all agree that less is more, right? Great. Your next step, then, is to list out where you’ll be using the fonts you end up choosing. Page elements. This is the group for headlines, sub-heads, and folio information (like page numbers, book title, and section title). Copy elements. This is the group for narrative text, photo captions, and pull quotes. 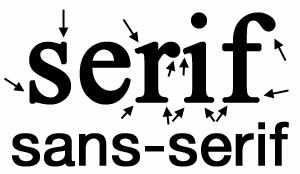 Historically, serif fonts have been used for copy elements, because they’re more legible in large bodies of text. Sans-serif fonts, on the other hand, have historically been used for page elements, since they’re generally considered to be more flexible. First, just because folks have historically chosen serifs for copy elements and sans serifs for page elements, that doesn’t mean you have to. Second, you probably noticed the font sizes here. The best way to determine the various size elements is to use a scale. We’ll spend more time on each of these right now. So you know the historical equation is sans serif page elements + serif copy elements = beautifully typeset page. Just because that’s what everyone has done forever doesn’t mean that’s what you have to do. You can flip the equation so that you use serifs in your page elements and sans serifs in your copy elements, you can exclusively use sans serifs, or you can exclusively use serifs. 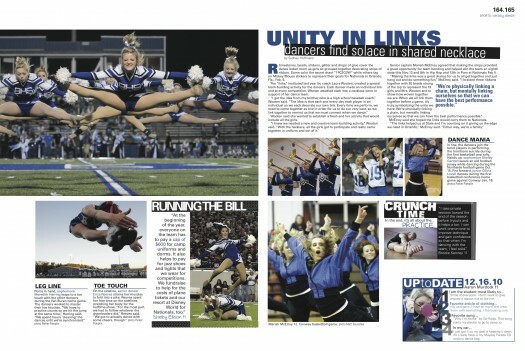 The goal is to combine your yearbook fonts in a way that creates the vibe you’re going for while being legible to your readers. By limiting your yearbook to two fonts and assigning them distinct roles, you establish a precedent. When someone opens the book and focuses on a message, they’ll know what a headline is going to look like and what a caption is going to look like. They don’t need to think. Consistency allows your message to get right to the reader without distraction. You probably noticed that, aside from the style of each font in the examples above, each one looked like a different size. They’re not. To produce those examples, we used the same font sizes as we laid out in the original font palette—47 pt headlines, 29 pt sub-heads, 11 pt body copy. Which brings us to a final point in building your font strategy: Size matters. With some fonts, an 11 pt body copy will seem really small. With others, it’ll seem really big. There are a lot of reasons for this (and mostly all are super-technical typography reasons), but the two that you can get away with knowing are cap height and x-height. Cap height refers to the height of a capital letter (usually an H), while x-height refers to the height of a lowercase letter (usually an x; hence the name). These heights vary between fonts, which makes an 11 pt body copy look so different. Because your yearbook fonts can vary in legibility so much, you’ll want to determine a set of sizes that work best for the fonts you pick—and for your readers. Do that by setting a scale. A font scale is an organized approach to increasing or reducing your font size, based on where that font is going. It’s easy to do, and once it’s set up, it’ll save you a ton of time. Find a font size that feels nice and legible. Rule of thumb: Something between 10 and 12 pts usually works best for body copy. We’ll split the difference and use 11 for this example. Multiply—and divide—that font size by a predetermined ratio to get the font sizes for your other elements. There are a lot of ratios that typographers and designers use when scaling fonts, but one of the oldest is the Golden Ratio (we’ve been crushing on it for a long time ourselves). The Golden Ratio roughly translates to 1.618. So, you’ll use that number to scale up—and down—until you find the right sizes for each of your elements. At this point, you’ve got a fully developed yearbook font strategy. Document it somewhere. That way, your team will have access to it when designing pages. The cool thing about yearbook fonts is that you can slightly manipulate the way you use them to create a variety of different looks. One of the easiest, and most impactful, ways to create different looks is to play with your font’s justification. Justification is basically a fancy term for how you align your text. Left Align. Your text is flushed with the left-hand side of the margin. This is pretty much a default these days, since left aligned tends to be easier to read, and has a reputation as being more modern. Center Align. Your text is in the center of your margin, so it’ll end up surrounded by a good amount of white space. This helps draw attention to your text, so you’ll want to use this when you have something you want the reader to focus on, like, say, a headline. Right Align. Your text is flushed with the right-hand side of the margin. Given the fact that readers read from left to right, a right-aligned font block has a distinctive look. Some might even say unnatural. But if you use it correctly, it’ll look great. Use it for a pull quote to separate that block of text from the rest of the page. Full Justification. Your text is aligned to both margins. It’s a very traditional look that’s still used in legal briefs, court decisions, and things like that. If you’re looking for something really buttoned-up, this would work well for you (especially if paired with a serif font). Beware, though: If you justify your text, you’ll probably end up with some weird spacing between words. One of the best ways to make your text stand out (without switching fonts) is to punch it up with accents. You can use drop caps, accent them with graphic elements like highlighting, and stack your text to create more compelling visuals. Here are a few headline examples to help you visualize the possibilities. If you don’t take anything else away from this post, take this: fonts impact the way people feel when they’re reading your yearbook. Pick one or two that make them feel the way you want them to (and the way that corresponds to your theme), and you’ll be in good shape.